A typical avionic busbar connected to the main busbar. A common tie point for all electrical wires required to be at the same voltage and designated as primary. 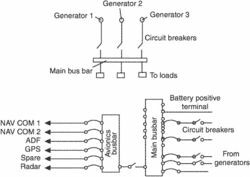 See also busbar. As for the bus stations, Minister Kalilov said it is necessary to leave only 1 main bus stations and turn the rest of the bus stations into the branches. The object of the contract is the public transport of passengers by bus transport on approved routes from the municipal transport scheme for the following main bus routes: - 9 - second clinical base - balkanstroy, - 10 - pleven - orleto bus station, - no 11 - lvt - chaira cemetery, - 12 - lvt - second clinical base, - no 13 - bc "kailuka" - second clinical center, - 84 - bc. The walk started from the main bus stand and concluded at the district police lines. Eleven ticket vending machines (TVM), which enable users to issue and recharge tickets, were installed along with nine banknote reloaded (BR) machines and two ticket office machines (TOM) to sell tickets at the main bus stations, said a DoT press release issued on Saturday. The chief Minister said hiring of the necessary staff required for the construction work of the RBT was being started, adding the project had four packages the first from the main bus terminal Chamkani to Qila Balahisar, the 2nd towards Aman Chowk, the 3rd ends at Hayatabad while the 4th included construction of shopping plazas and other commercial buildings. Summary: Sidon's mayor moved to play down the concerns of bus drivers in the southern city after a rally Monday to protest authorities' failure to provide a temporary alternative after the main bus station was closed. THE main bus terminal serving the tourist area in Kato Paphos will be moved in a few months as it is built on top of a major archaeological site, according to the local municipality. The installation of newly designed stands displaying 3D bus charts is compatible with the needs of customers and users of mass transit means and main bus stations," added Adel Mohammed Shakri. We had a recent situation in Keresley where the main bus route was closed and the bus company had to re-route the service, taking an extra 15 minutes. BYKER Bridge is a 40mph zone, a main bus route and surely it is common sense for cyclists on this occasion to use the footpath (as indicated), as overtaking traffic cannot give them a wide enough berth for safety. THE powers that be have opted for their new site for the Wales BBC HQ at the present main bus station. SIR - The powers that be have opted for their new site at the present main bus station.